Another thing I did today during music rehearsal was preparing the calendar to be distributed to the cast tonight. Bob Eagle is directing this show himself, and he’s had his breakdown of the rehearsal schedule pretty much done since last week. 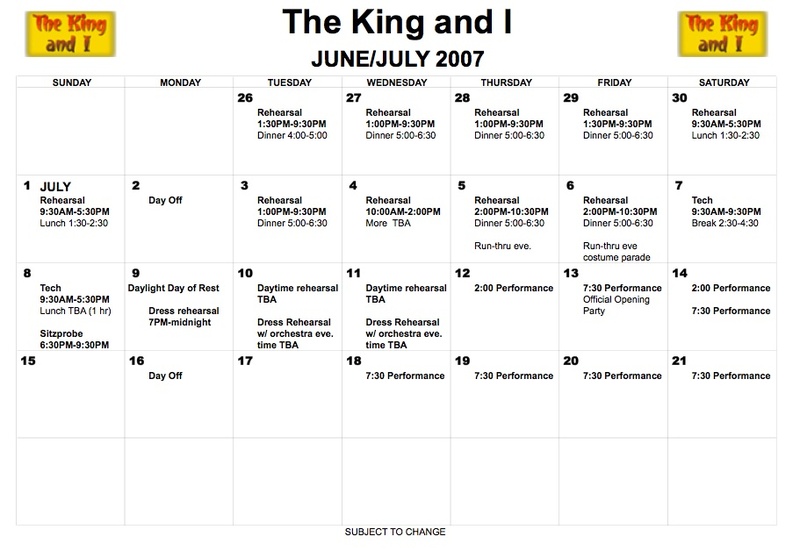 We made some adjustments and clarifications to the tech schedule at the production meeting in the morning, and with that I went about creating a calendar to outline the entire production in brief for our cast. 1. Most importantly, is anything scheduled that’s a violation of Equity rules? The first thing I look at is span of day. Our contract allows for either an 8.5 hr day with a 1.5 hr meal break, or an 8 hr day with a 1 hr meal break. I make sure it’s not over that amount, and that the proper meal break is applied depending on the span of day. The next question is whether the meal break is spaced properly in the day. There is a decent amount of flexibility in this, but there can’t be more than 5 working hours on either end of the meal break. The final question is the 12-hour rest period between rehearsals. If rehearsal ends at 10:30PM, the next day’s rehearsal can’t start until 10:30AM. This is something to keep an eye on at Reagle because rehearsals are late in the day during the week and early on the weekends, to accommodate our cast members with “real jobs.” It’s an easy mistake to accidentally infringe on the 12 hours between Friday night and Saturday morning. 2. Once I know the schedule is legal, the next question is, does it make sense? One of the greater challenges of stage management is that you’re supposed to think of absolutely everything and fix everyone’s problems before they occur. Thinking through the schedule and looking for trouble spots or areas that could obviously be improved is part of that. 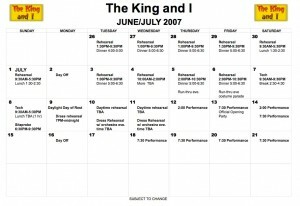 In my perusal of the schedule today, I discovered that we had a 1.5 hr lunch break for an 8 hr rehearsal on the weekend of the first week. As much as I hated to give up that nice long lunch, the fact is we don’t need that long of a break if we’re taking the shorter day, and were losing a half hour of productive time each day as a result. So we fixed that. I also suggested a time change on the two days before tech to shift an extra hour to the evening so we would have more time for our scheduled runs of the show. I hate math, and I hate math with time, but it’s very helpful to be able to work quickly in your head with common time-usage situations that one might encounter in rehearsal. Part of this is knowing your contract’s specific rehearsal rules inside out (or having a copy of the rulebook handy for those really obscure questions, like how many hours can you rehearse on a 1-show day after the week of the first public performance — I always have to look those up). Equity’s web site has all the rule books in PDF format in the Document Library. The beauty of this is that a) they take up no physical space or weight in digital format, and b) you can easily search them for whatever term you’re looking for. I was lucky in my early career to have spent most of my non-Equity years working on Equity Showcases (unless you don’t count working for like $0.25 /hr lucky), where I had to enforce all the Equity rules even though I wasn’t covered by them myself. By the time I got my card I was completely comfortable with all the basic rules. The numbers change (in general as the minimum salary goes up, so does the number of hours you work), but for the most part the concepts are the same. If you can afford to work for very little, I recommend it to aspiring Equity stage managers, as it will allow you to already know what you’re doing if you suddenly get your first Equity contract as a PSM and everyone expects you to know what you’re doing. It took me a long time in my career (oh, about five-and-a-half years) to find a format for a calendar that I liked. Any calendar creation software was too restrictive, and in fact I think they’ve stopped making any kind of apps to do that, they assume everyone uses Outlook or iCal or something. Well I like to have complete control over the layout, and I don’t need to sync it to anything, so I couldn’t deal with that. When I was production coordinator of Bingo in Florida, the company manager had a rather nice calendar she made in Excel, I decided that was the way to go from now on. I came up with a layout I liked, and have used it as a template ever since. It’s very blank, which I like because you can really set it up however you want. You could make Wednesday the first day of the week if you really felt like it. You can also see in my example above how I have made a calendar for “June/July.” Since our whole process only takes four weeks there’s no reason to waste space and confuse people with a whole calendar for each month. I can start and end it wherever is most useful for the period of time I’m dealing with. Want to play with it? Have fun. While I’m sharing files, here’s something else I had to print out today. The two-foot marks in the dance studio are starting to fall off, and we’re going to need to replace them before starting dance rehearsals tomorrow. As a result of the occasional need to rehearse down the street at the Studio of Creative Movement, where we need to bring our own numbers and remove them when we’re done, two years ago I created this PDF, which consists of three pages of fairly large numbers, from zero (center) to 18, which is as high as the numbers go on the Reagle stage. 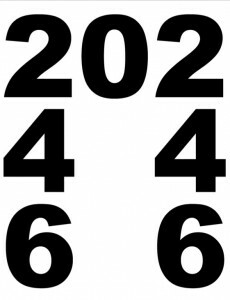 Since I pretty much always have my trusty Canon i70 printer in rehearsal, if somehow I wind up somewhere in life needing to put down numbers for dancers, I can print them out in a couple minutes. Having a tape measure can sometimes be the bigger problem, but in a pinch I have used the 11-inch side of a regular piece of paper, adding the extra inch by sight for every foot. Not the ideal way to do it, but it works. 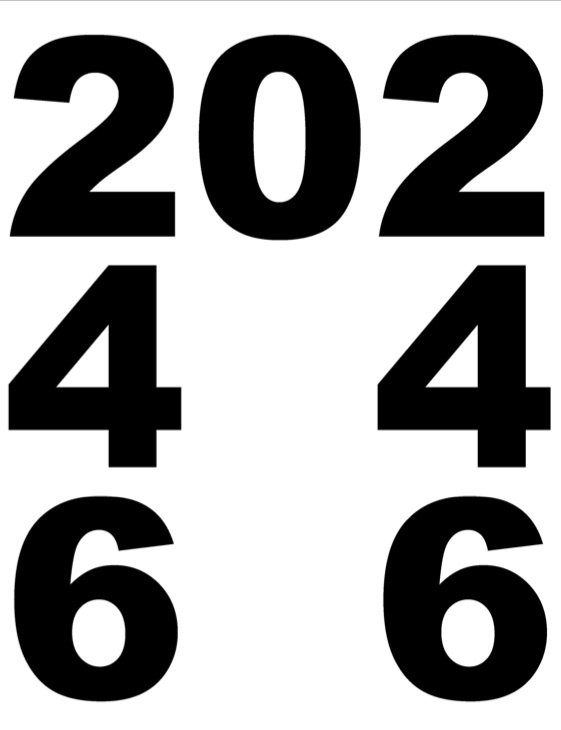 When I’m really prepared, I have in my kit a set of these already cut out and held together with a big binder clip, so they’re ready to be taped down right away, instead of taking all that time to set up the printer and cut out the numbers. It’s a real lifesaver at those horrifying moments when you realize 5 minutes before rehearsal that the room doesn’t have numbers, or somebody ripped yours up overnight. Of course if I was really slick, I’d have some pre-made, sturdy numbers like those you’d use to put the street number on the outside of your house. But that would assume I was prepared and planned to put down the numbers. The whole point of this PDF is that it’s there when you’re caught unprepared.